Again, the variety of styles is striking... We have a very painterly work of George Fearnside, then a group figural piece that almost brings to mind the work of Thomas Hart Benton with a bright palette and numerous figures at work. Finally we finish with a very realistic portrait of Professor Crum. He was Head of the Department of Classical Languages at Lehigh U.
Mr. Fearnside graduated in 1928 from Lehigh and married a concert violinist Viola. He traveled the world working for the Dravo Company out of Pittsburgh. Both Dravo brothers were graduates of Lehigh. In their travels. The couple spent 12 years in Paris and purchased numerous drawings that have now been donated to several institutions. 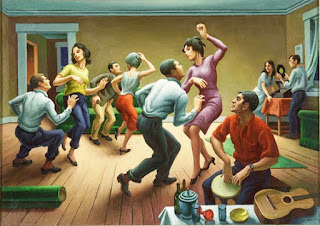 Earlier, we mentioned that this painting was reminiscent of Thomas Hart Benton. While the handling of the paint and forms is different, the color and composition have some similarities. 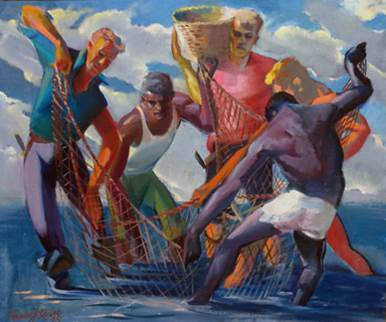 See the Benton image below. The figures are in both pictures are in motion, all in different positions with brightly colored clothing. 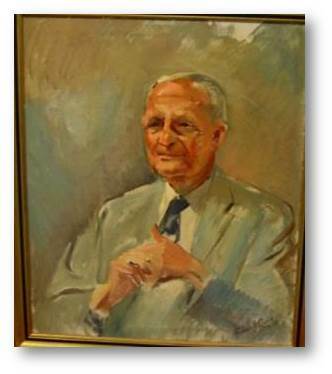 The portrait of Professor Crum was presented to him in1959 and it is very well executed in a classic pose. 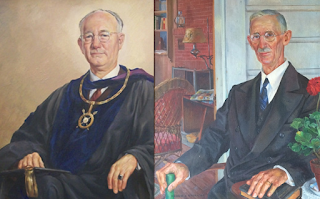 This pose looked familiar to us and we realized it is similar to the painting that started all this research- the portrait of Mark S. Hatfield "The Summer Pastor"
Comparison of Quirk Portraits He liked this view. Then again, how many different ways can you paint a portrait? One open question in viewing the paintings 15 years apart is "Has Quirk's technique evolved? 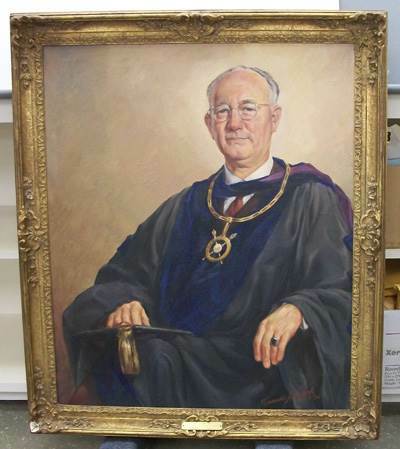 Or is he merely painting for a different customer who wanted a more classic portrait?"